Ballrooms and proper etiquette are not Aria Whitney’s area of expertise. She is not your typical British debutante but rather a free spirit who prefers breeches over corsets and adventure over balls. However, when her father goes missing she must force herself into the upper crust of English society to discover what happened. Her father disappeared while on an archaeological dig in Egypt. When his trusted friend and colleague is gravely injured, there isn’t much hope that her father will be found alive but she must try and unravel the mystery. The only thing that Aria has to go on in a list of rich benefactors in London society. Aria brazenly works her way into the balls but has unwillingly been labeled a title hunter. She doesn’t care what anyone thinks of her as long as she is able to gain access to anyone on the list left by her father. While at a party, she literally runs into a dashing Earl of Merewood, Adam. Adam thinks the worst of Aria when he finds her in his sister’s fiance’s bedroom, but at the same time he can’t get the stunning and strange woman off his mind. Aria is equally drawn to Adam but does what she can to fight her attraction for him….especially since Adam’s name is on the list Aria is investigating. For all she knows he could be the man behind her father’s disappearance. Historic romance, adventure, sizzling chemistry, balls, exotic mysteries….this book has it all. That said it was a difficult one for me to review. I loved Aria, I thought she as quirky, funny, vulnerable but yet strong all at the same time. I loved her wild streak and her tenacity. The first half of the book I really really loved her. I admired her spirit and her complete disregard for the rules. The second half of the book, more toward the end…. I was shocked at her character’s decline. I didn’t feel like it really fit for her. Having her character ‘change’ was good but the way she changed and how she was left at the end of the book didn’t fit with who her character was at the beginning. I struggled with her character evolution at the end of the book. After I finished it I found myself a little perplexed. I would have liked to have seen things end differently. Adam was dashing, brave, and charming–basically the perfect romantic interest. At times he was a little overprotective and stubborn but I was pleased with his overall character progression. I liked it best when Aria and Adam were together. I thought they had great chemistry and there was the perfect amount of sexual tension between them, I loved it. But I was sad they weren’t together more. I felt like they both had a lot going on in their personal lives that kept them apart too much in the book. I was hoping for a little more steamy love scenes though. When I first started reading the book I didn’t know if it was going to be a bodice ripper or not but after one of the first scenes in the book I figured it would be. There were a few hot and heavy love scenes but then there wasn’t the crowning jewel that I was anticipating, that was sort of a let down for me. This book was very fast paced. I started it and finished it almost in one sitting. It would be a great beach or a rainy day read without question. The story telling style was direct and to the point. I had no trouble getting into the story right away. The first half of the book was intriguing and I enjoyed all the secrets and mystery throughout. The second half of the novel, the story fell off a little for me but mostly because I was distracted by the change in Aria. Overall the novel was a good read and I liked it. I would definitely recommend it to historic romance readers and fans of Victorian era romances. I also wanted to touch on the cover design for just a minute. WOW just WOW. I am completely in love with the cover design! I love the color scheme and the choice of background image. The cover indicates classy romance, not a trashy romance. It’s perfect! Five stars for the cover design! 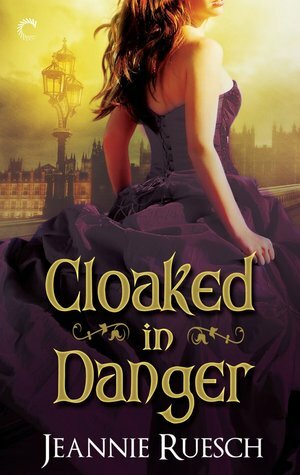 Be sure to check out the other Cloaked in Danger tour stops for interviews, guest posts, reviews, and giveaway opportunities. I also included a list of the other tour stops at the end of this post! I see a woman who loves with her entire heart, who is as loyal as a lioness and will fight to defend her family with the same fierceness.